Monday, June 4. And it was a great second day of the conference! I am really proud of Raizel and her team; they did a fabulous job. It’s not easy to pull off such a successful conference, especially when it was the first one in Israel, but they did it beautifully. Today it was my job to talk about essence and Oneness, and I did some reflecting on this very deep subject the night before and early in the morning before I went, and I had a brand-new insight about essence and oneness in relationship to levels of consciousness. I got very excited about presenting this new way of seeing it but was a little nervous about it because it could not have been more new for me and I wasn’t sure if I could pull it off. It also took a lot of writing out the levels, which I did in my notebook at the apartment, then had to transfer onto a flipchart before the conference day officially began. But I had reinforcements, as Raizel and Sue Lachman were presenting with me. First we opened it up to insights from the audience from yesterday or this morning—we did not allow any questions or other comments –and that resulted in a beautiful feeling to begin the day. Then I turned the microphone over to Raizel and Sue. After a break I then presented my story of the cloud and there are no answers in the cloud and the importance of looking to the light, and then I presented my new levels of consciousness chart. It seemed like it had a big impact. I felt bad that I didn’t have time to include Raizel and Sue anymore in my presentation, but especially since we did a deep listening activity around essence and Oneness, we simply didn’t have the time. In fact, the time seemed so short that I felt a little rushed and forgot to talk about deep listening again for the new people who did not come yesterday. So after I had set up the activity I had a lot of people come up to me and ask me what I was talking about. Oops. There were also some new people there who didn’t know much of anything about the Three Principles, so they were a little lost, but all in all that whole segment seemed to go very well. Again, I was kind of swarmed by people at lunch time asking me questions, and I couldn’t seem to get over to the lunch table, but a fellow named Mendel who had handed me a plate of food yesterday while I was talking did the same thing for me again. That was so nice of him! After lunch I was scheduled to moderate a panel of two people, but because I wouldn’t have much to do I begged off of that and while it was happening went outside, lay on the grass, and took a much-needed nap. That revved me up again to do the final session with Raizel. Luckily, we had the idea of hearing from people about what they were taking away from the conference, which closed the conference with a very nice feeling, so I didn’t have to say much. As I said, it was a beautiful conference, and for some reason I felt I had given the best two talks of my career. After taking a taxi back with David, I needed to have dinner alone again because I was completely talked out. Fortunately this time I remembered to get some shekles from my book sales; my books completely sold out and probably I could have sold twice as many as I had sent there. My intention was to have an early night, but suddenly I heard a lot of yelling and screaming in the apartment building. I don’t know what was going on because they were yelling in Hebrew. I poked my head out the door and saw a lot of other people doing the same from their apartments. But I couldn’t see where the commotion was coming from. This lasted quite a while and it wasn’t easy to get to sleep. Very proud of yu Jack. You are such a blessing to the sharing of the 3 Principle understanding. 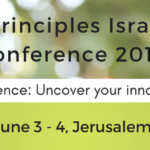 To lay a foundation for conferences in Israel, is important in so many ways. Have a great journey home.